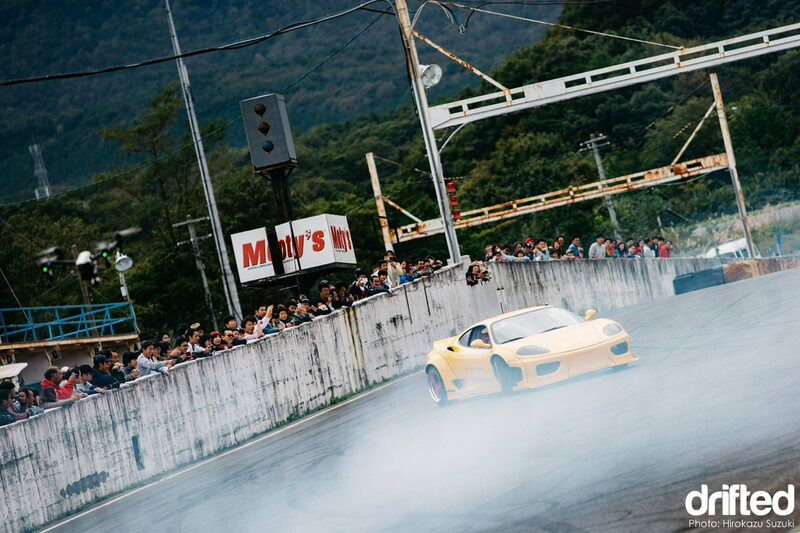 It’s not everyday that you see a pristine Ferrari being drifted full tilt around a track. 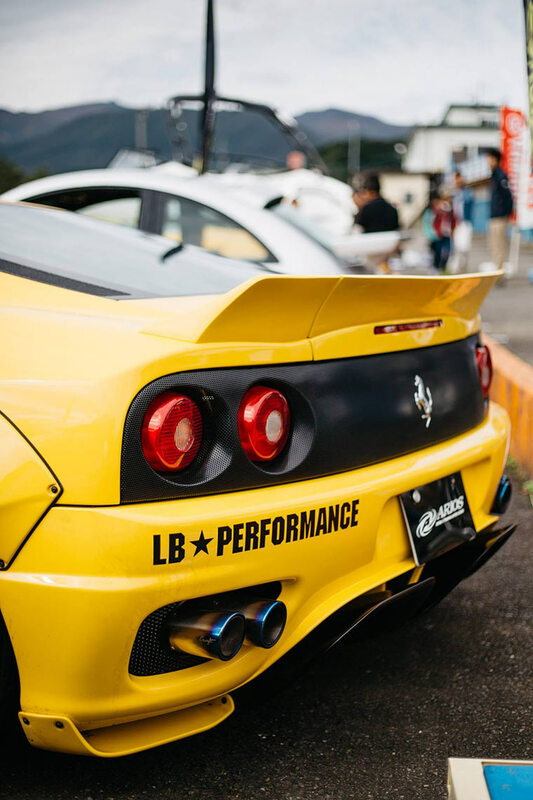 Introducing the ARIOS X Liberty Walk Ferrari F360 Modena. I had to find out more about this hard charging exotic and it’s crazy owner..
As a fan of the Ferrari F360 myself and being aware that values are rising through the roof to see one being drifted to within an inch of it’s life was eye opening to say the least. I had to find out more about this hard charging exotic and it’s crazy owner.. 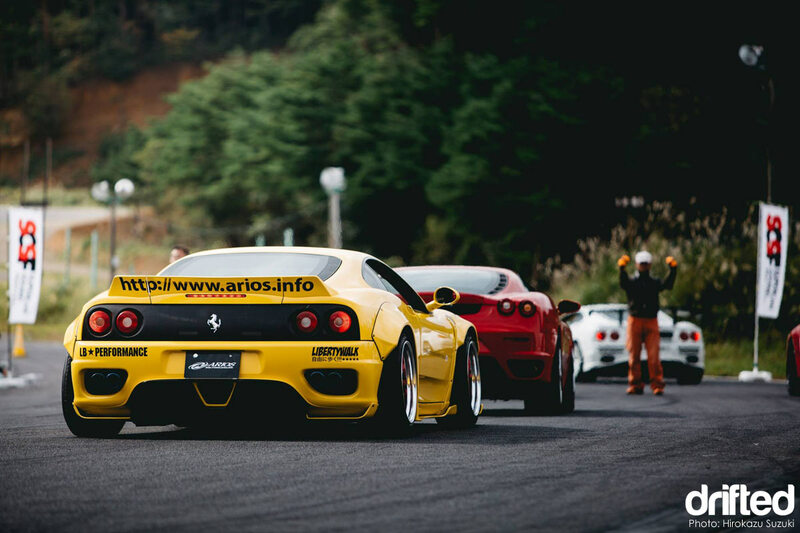 The bright Giallo (yellow) paintwork on the Ferrari proudly proclaims ‘ARIOS’ and after a quick Google I found myself on the ARIOS Facebook page. I dropped them a message and got chatting with ARIOS’s owner, a die-hard car enthusiast called Hirokazu Suzuki. Hirokazu-san and I got chatting about his business, his drift car and his future plans for ARIOS. 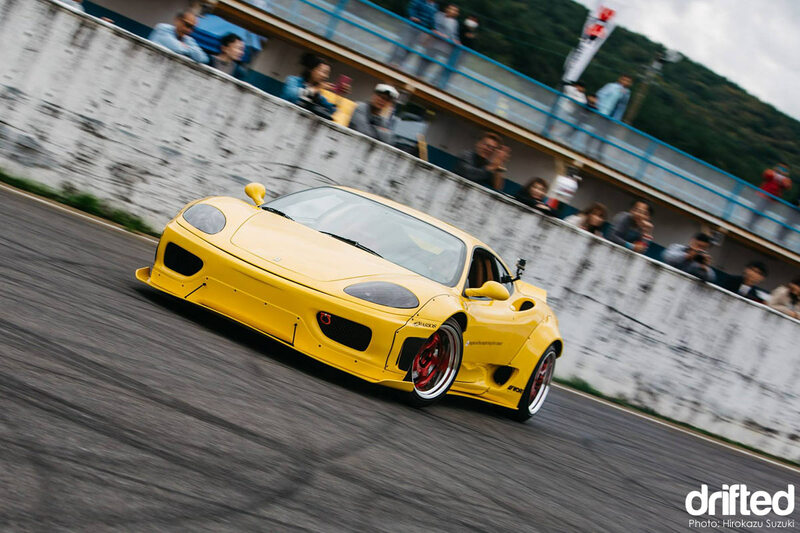 ARIOS is an aftermarket aero parts company, his Ferrari F360 is the companies flagship demo car and features his own brand aero front bumper, side skirts and rear spoiler. ARIOS has also developed it’s own in house complete coilover suspension system which all of his cars use. 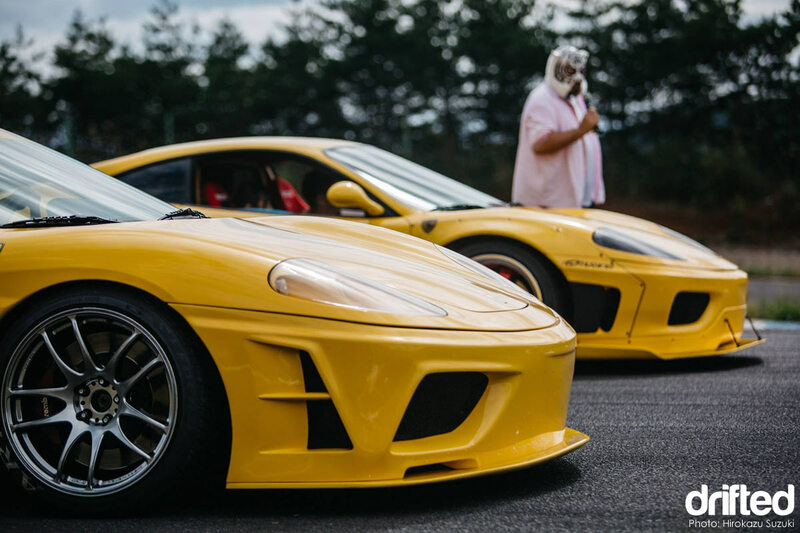 As it happens Hirokazu-san has now built a second yellow F360 Modena! This new car is designed to show his potential customers how wild you can take the F360 platform. 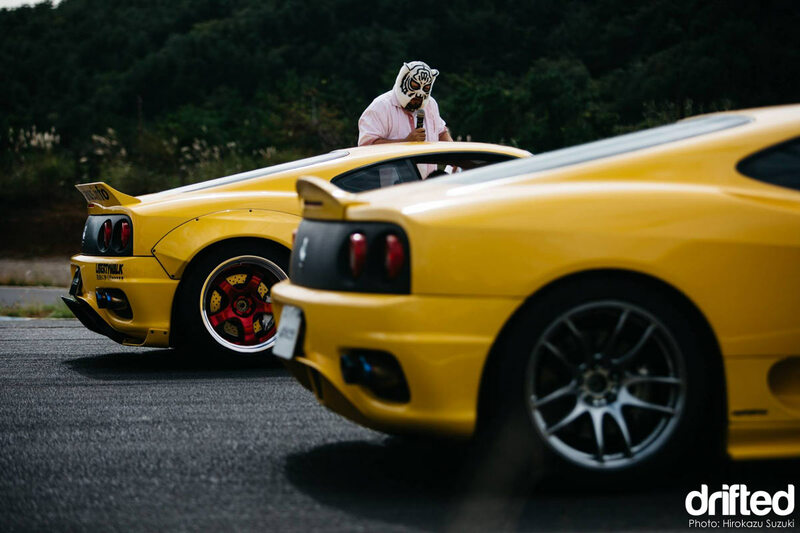 Hirokazu teamed up with the now infamous Liberty Walk Performance company to take his Ferrari to the next level. 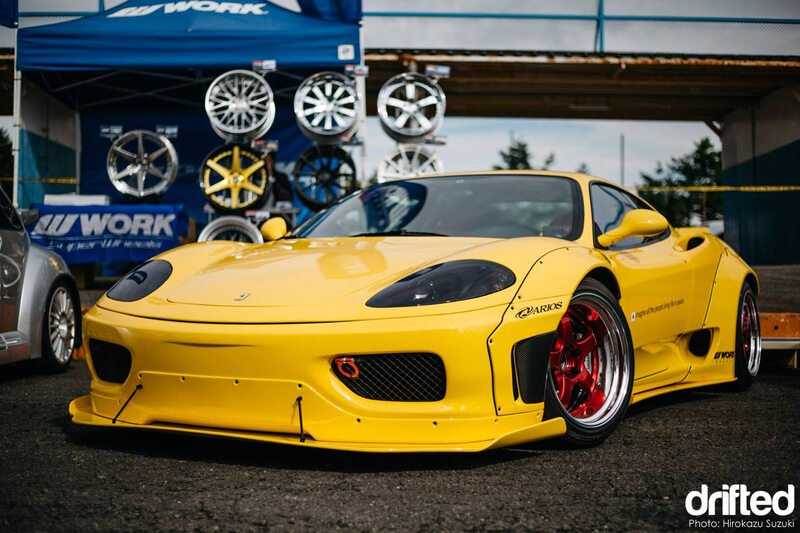 Liberty Walk provided their brand new Ferrari F360 aero package for the project consisting of a front diffuser, wider front fenders, side skirt diffuser, wider rear fenders, rear diffuser and rear duck tail wing. This package is available for both Modena and Spider flavours of the F360 right here. The front light lenses have been tinted black. As with most Liberty Walk aero packages the key design detail is the massive overfender wheel arches. These signature wheel arches give an aggressive style and plenty of space for large wheels. Just like other Liberty Walk overfenders to fit these parts you will need to be very brave indeed, cutting your extremely expensive front and rear fenders and then riveting and bonding the new arches on. 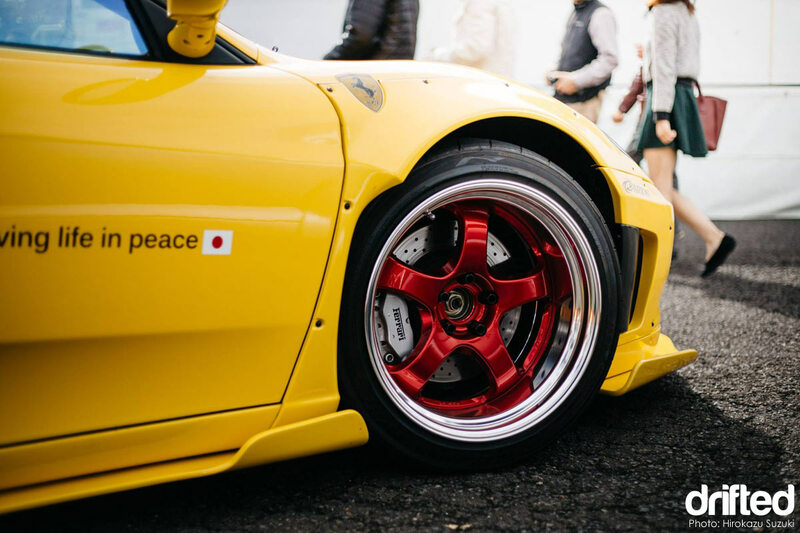 For the wheels Hirokazu-san partnered with WORK Wheels Japan, WORK offered up a set of 18″ WORK Meister S1 three piece wheels, the stepped lips top a polished deep dish with the classic five spoke centers finished in a candy red. The fronts measure up at 18″ 9.5j and the rears at 18″ 11.5j. Unfortunately I can’t reveal the offsets but I can guess around ET +0 front and ET -20 rear. This shot highlights the aggressive rake of the Liberty Walk rear spoiler and the enhanced rear diffuser extensions under the rear bumper. The quad burnt titanium exhaust tips are the business end of a Power Craft exhaust system. Power Craft is a Japanese company that builds extremely loud “F1” style exhaust systems for exotic cars. You can check out Power Craft’s website here. 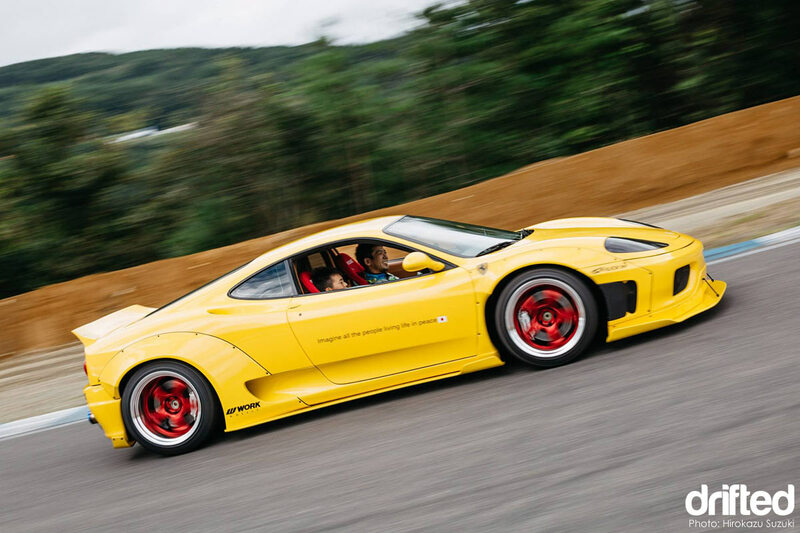 The F360 already pushes out 400bhp from the factory so further engine tuning was not required. The car runs a complete ARIOS Original coilover suspension setup, this fully adjustable system has been configured for drifting. The interior of the car is mostly standard barring the addition of a pair of red Recaro Pole Position fixed back bucket seats and their associated seat runners. 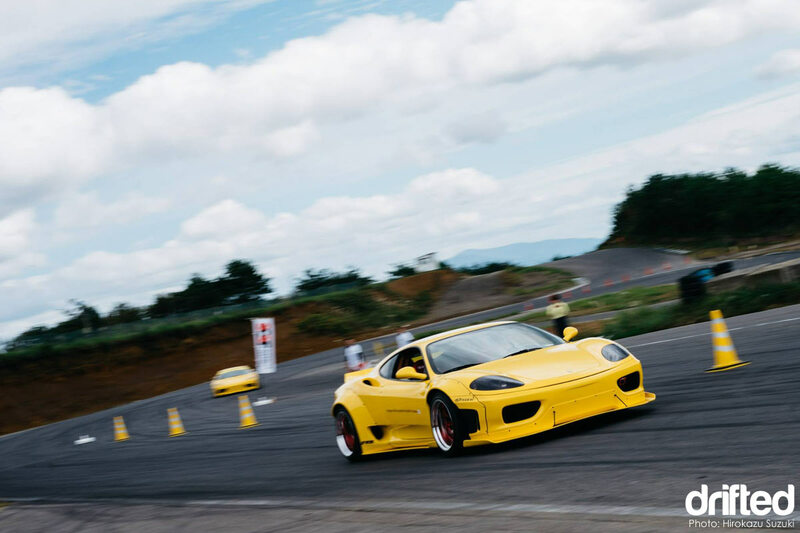 I think that Hirokazu-san’s latest Ferrari is a fantastic project, with it’s original styling, a howling banshee soundtrack and a high revving OEM power plant this supercar is now a potent drift car. While the styling may not appeal to the purists (and that is entirely understandable) this guy is out there driving these cars hard, promoting his business and generally having a great time. While the hard track miles and aggressive body work may harm the car’s fiscal value, his priorities are clearly defined; fun first, money later. I really respect that and I wish Hirokazu and ARIOS all the success in the future. 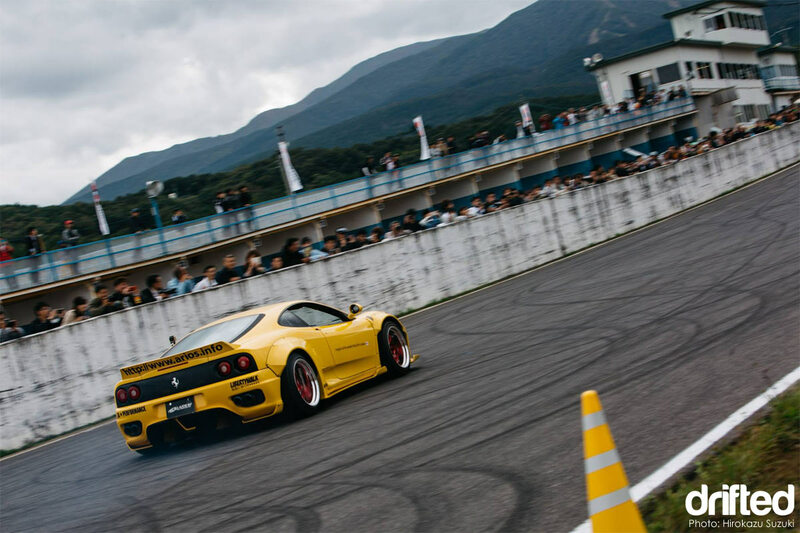 You can see plenty more ARIOS Ferrari drifting videos over at the ARIOS YouTube channel. If you like what you see and want to keep up to date with ARIOS, head on over to their Facebook page and give them a like!. If you enjoyed this Liberty Walk equipped supercar why not check out this incredible Lamborghini at GTSpirit.com? Please show us some love and hit the ‘share’ buttons at the top of this article.